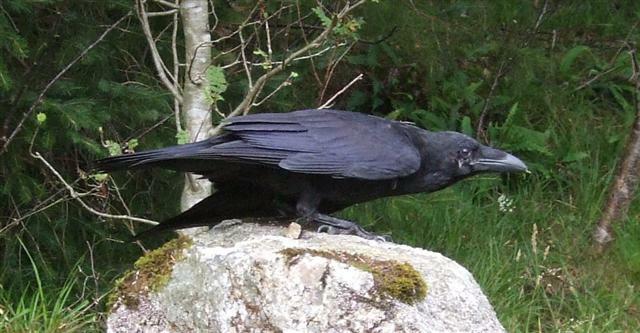 The raven is our largest corvid, the family which includes both carrion and hooded crows and jackdaws, all of which are widespread on Arran. Over the years its fortunes have fluctuated with mans attitudes to it. Way back in earlier centuries it was a familiar bird throughout Britain as it scavenged around human habitations capitalising on the refuse and discarded food left lying and was even regarded as a asset since it helped to clean up the streets ( it was a protected bird in Edinburgh around 1600). On farmland it fed on the carcases of dead animals left unburied and as such fulfilled a valuable role. With improved agriculture and better hygiene in towns and villages it became less welcome and coupled with its reputation for killing lambs soon found itself on the bounty list and treated as vermin. Gradually its range retreated to the uplands although even here it was in conflict with game rearers, grouse moor owners and hill farmers. After years of persecution and in the face of rapidly reducing numbers it was given protection in the 20th century. Like all the crow family it is intelligent and versatile. Ravens have been known to follow stalkers onto the hill in anticipation of feasting on the gralloch when a deer is shot. It breeds as early as February on exposed crags and cliffs raising broods of up to five young birds when winter is still lingering in the hills. Paired birds are faithful to their nest site throughout the year but their offspring and pairs without a territory form flocks which feed and roost together. On Arran, as in many parts of Scotland, raven numbers have recovered after years of decline but increased numbers, especially of non territorial birds, has brought them into conflict with man again. Farmers here have experienced losses to livestock and are understandably keen to protect their animals from future attacks. Over the last few years licences have been issued by the Scottish Government to shoot limited numbers of birds. In an effort to establish the overall population of ravens on the island at different times of the year, study the impact licensed shooting has had and quantify the level of damage to livestock, Scottish Natural Heritage has commissioned Malcolm Whitmore to carry out a study and produce a report. The field work will run until June 2012. 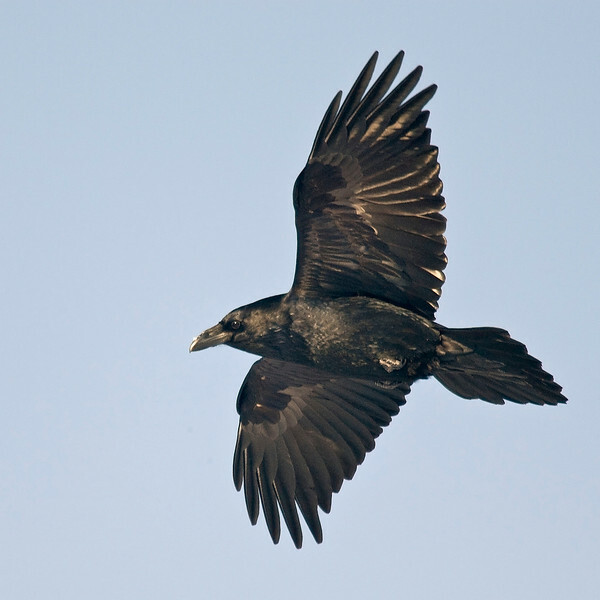 Any sightings of groups of ravens heading for roost in the evening or leaving at first light would help to gain a better understanding of the birds and whilst many of the nest sites are of long standing and well known all information on breeding locations is welcomed.